(TB260JF) Cache of the Day Rainbow Trout Geocoin - Gone Fishing! Use TB260JF to reference this item. 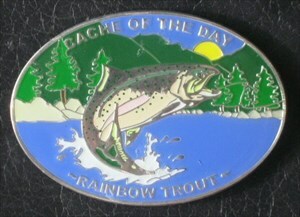 Take me to a cache at your favorite fishing place. Add a picture of your catch. Please log where you see it or where you pick it up and where you drop it off. Gallery Images related to Gone Fishing! Picked this up, moving it along. Grabbed today from Par the Folks, will move on soon.